• Application period from July 15th to August 14th. • Ages 9-17 (as of July 15, 2017). • Applicants not affiliated with entertainment organizations / agencies. in 2018, Hello! Project celebrates its 20th anniversary. For the 20th anniversary, we are looking for new members to join Hello! Project. It could be YOU in : Morning Musume. '18 / Angerme / Juice=Juice / Kobushi / Tsubaki / A New Group / or You may be a new member of the Women's Drama theater (Engeki Joshibu) !! You have to be confident in singing and dancing, You have to love singing and dancing, and love Hello! Project, please apply by all means. Any single woman from 9 to 17 years old can apply. However, please note only those who can attend lessons in Tokyo will be eligible. For details of the application guidelines, please visit the audition special website. Last time they did a general H!P audition was back in 2000, that's when we got Matsuura Aya and Sheki-Dol. But the last H!P audition that wasn't localized (they had auditons in Korea, Kansai region and Hokkaido) was the H!P Egg audition in 2004. They've just made every group massive, we have a bunch of kenshuusei and now auditions? Seems desperate. I guess the youngest will join the KSS, the older ones the new groups then. Maybe they're choosing the members for Ichioka's group through this? But then again that'd take ages. Seems like they are doing this because calling it a KSS Audition isn't going to catch any flies. This is definitely a honey trap. I hope they actually get some potential girls to join. In past auditions it's clear they like certain girls but not for the groups they are being put into and throw them into KSS till the next big audition or group appeared and put them in there. They've been doing it for years now. At least now they have one big catch-all audition instead of multiple auditions. This may severely limit the number of older applicants considering our recent talk how everyone is an idol these days and we'll get a bunch of 10-year-olds again. Do we know what is the KSS lesson schedule anyway, even roughly? Every decent sized company has the no affiliation rule. Last year HKT48 dropped one of their new kenkyuusei after just a week once it came out she had been with another agency when she auditioned. I think I remember reading once that the kenshuusei have lessons either once or twice a month. That's kinda silly. I get that H!P would not want someone, say, ex-AKB to join, but it eliminates all those at best part-time indie idols too, since technically whatever contract they have would still count as being with another agency. That leaves those who never even tried, or were unsuccessful, or already quit, while those determined and ambitious enough to become an idol and wanting to upgrade to H!P are not even allowed to compete. I honestly expected to hear a number of times a week. Reina went nearly a decade without vocal lessons, it's not terribly surprising that girls who might never debut aren't getting multiple times a week training. Maybe it's more often now that they're specifically saying you must be able to come to Tokyo. In the past we've had trainees who only participated in the H!P concerts that were closer to their homes. Also, I think the agency thing is to avoid possible legal issues. The "honey trap" angle was the first thing I thought of, too: accepting girls as young as 9 is the giveaway. They probably see multiple graduations from existing groups on the horizon and just want to be prepared to both fill those slots and ensure that KSS isn't drained too much when they do. Why is accepting 9 year olds the giveaway? The age range has been 10-17 for years now. Because they're not gonna put a 9, 10 or 11 year old in any of the existing groups. They will put them in KSS, though. That's why. 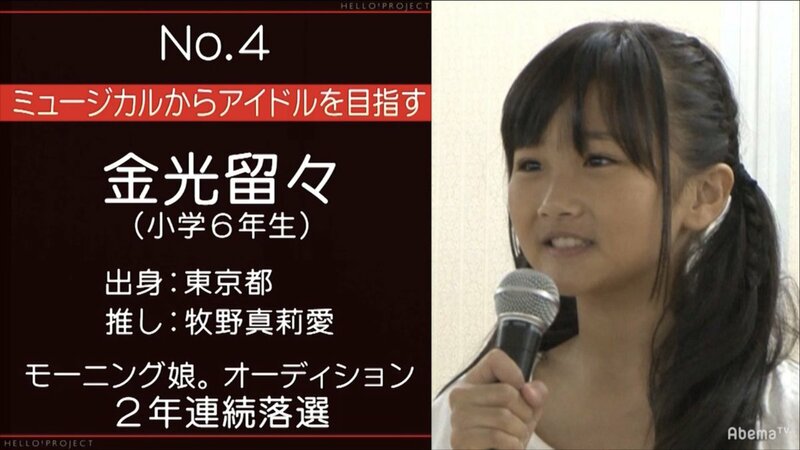 How old is Tsunku's daughter? 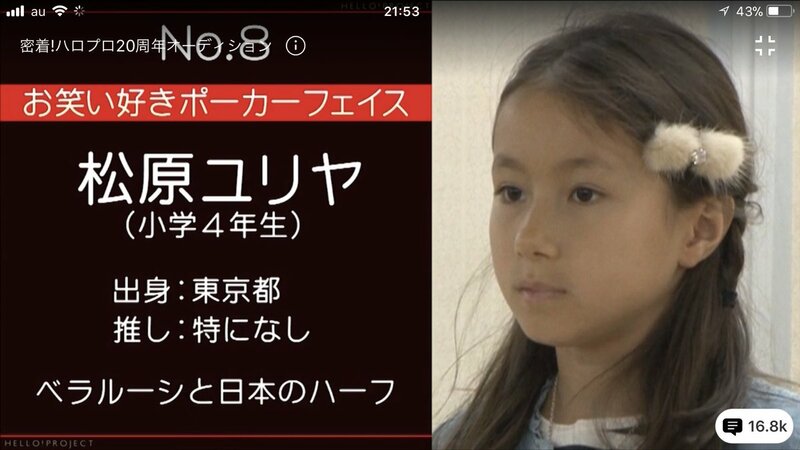 His eldest daughter will be 9 this year, but Tsunku's family no longer lives in Japan. He just flies in to work. Starting from November 13, title of the show is Shoujo-tachi no Ketsudan ~Mitchaku!! Hello! Project 20th Anniversary Audition. The auditions will be watched and probably commented by several H!P OGs and current members, first episode being Yaguchi, Yasuda, Kumai, Wada, Kanazawa, second Yaguchi, Yoshizawa, Maimi, Wada, Kanazawa. Well, that's at least something. Not sure if I wanna watch because I strongly suspect my least favorite ones will end up in groups I like. I know I say this every time some posts a new picture of her, but Kei looks great. At least it may be the comeback of auditions fans can follow "on live". This is how they should have been doing MM auditions this whole time... I mean, at least we get to see some "live" audition footage! There's no connection when you know the winners and just look back at THEIR audition process and no one else's. The audition is partly what made Sayashi, Sayashi. They haven't had a show to air auditions on and the general public doesn't care. The wota are gonna pick a favorite anyway. The 2nd stage was split between Tokyo and Osaka. In Tokyo there are bilingual twins and a girl whose parents are living vicariously through her who is trying to achieve her parents' dreams. In Osaka there's a middle schooler with a perfectly proportioned body and an Oita Onsen idol. Omg twin idols sound kawaii as heck. I'm on board. Former Onigokko and Negaigoto member. Onigokko is the group current kenshuusei Yamada Ichigo used to be a member of. Auditioned for Morning Musume twice. Auditioned for MM's Shinseiki Audition. Was a finalist in the previous MM audition. I guess 10 years old is too young to call it bitchy resting face. 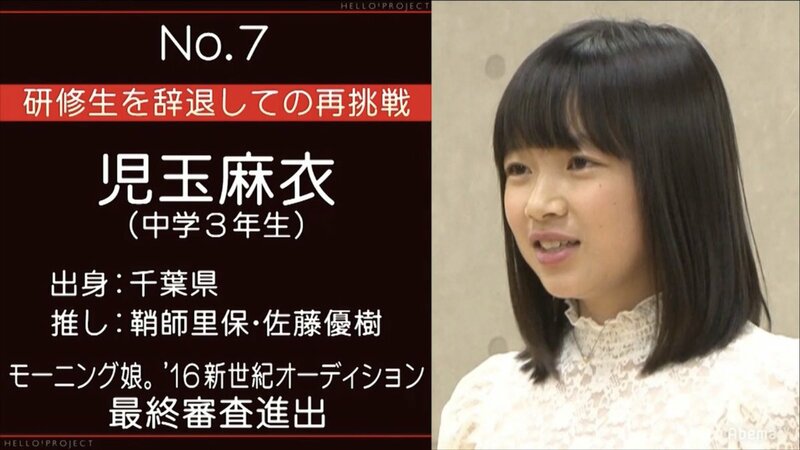 Hashimoto apparently wants to join Kobushi Factory. She only recently gained internet access and said she doesn't know much about H!P. 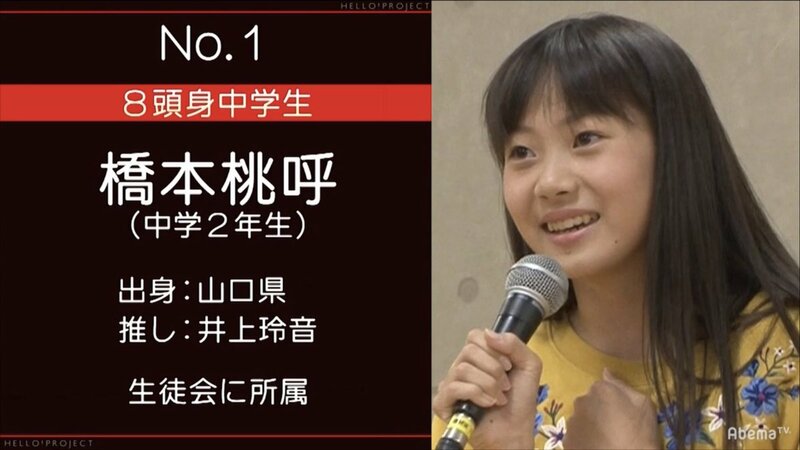 Kodama turned down an offer to join the Kenshuusei last time but decided to reaudition after seeing kenshuusei footage of girls she auditioned with. Looks wise Goto Sayaka gives me the H!P pre-idol feel. But so far Anna and Nanami are interesting to me. So is Yuriya. How can you only recently get internet access when you're 14? I mean it's not impossible, not sure where she's from and how strict her parents are, but that's really... surprising. And while they're not super popular, I'd say H!P is at least somewhat known through Oricon. Nothing against her though, just surprised. Ruru is 12 and auditioned for MM twice? I mean if she tried the Shinseiki auditions she would've fit the age requirements but that's determination, trying out at 10. Yuriya is out by the next round. She's cute and I've got a soft spot for her because our names sound alike, but she's way too child-like.